Test and seal the stone — If your home has travertine installed in the bath, kitchen, dining room, etc., and it has a honed or tumbled finish, check with your designer to make sure the stone was sealed. This will help in the event of a spill of red wine, cranberry juice or another aggressive agent, especially on countertops and floors.2. Wipe-up spills immediately — The stone is sensitive to things like tomato sauce, ketchup and certain carbonated beverages. It is best to clean up quickly using hot water and a stone cleaning product. 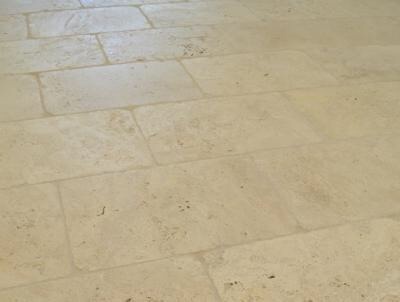 Do not use vinegar, lemon or orange cleaning agents, bleach, ammonia or store-bought products that contain acids, alkalis or other chemicals when cleaning travertine stone.3. Dust mop a travertine floor — Use a clean non-treated, dry dust mop regularly and then once a week use a wet mop with hot water and a specially formulated stone cleaning agent. It is best not to vacuum stone flooring as the machine can create chips and cracks.4. Protect and cover — Door mats and carpet runners should be used to help keep foot traffic from bringing in dirt and elements that will damage the travertine. For countertops and baths, use coasters for all drinks and decorative trays to protect the travertine from cosmetics and bath products like colognes, perfumes, oils, soaps and other toiletries. Prevention is the best remedy when it comes to maintaining travertine stone. TLC Carpet Care preforms Steam Carpet Cleaning, Tile Floor Cleaning, Upholstery Cleaning, Marble/ Travertine Floor Polishing and our new service. TLC Has been servicing the Castle Rock Co area for 12 years and we offer the most Affordable Carpet, Tile & Upholstery cleaning in Castle Rock Co and Douglas County Area.